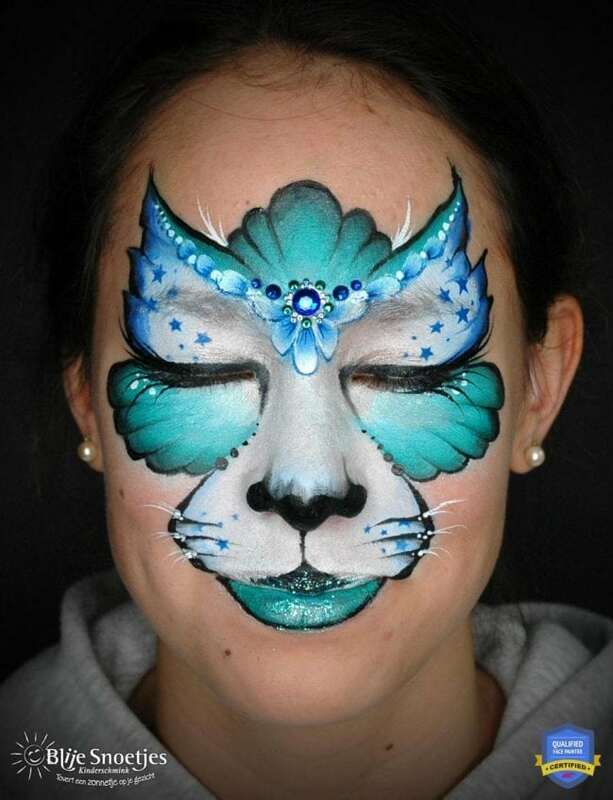 One of the most essential designs for any face painter is the kitty cat. 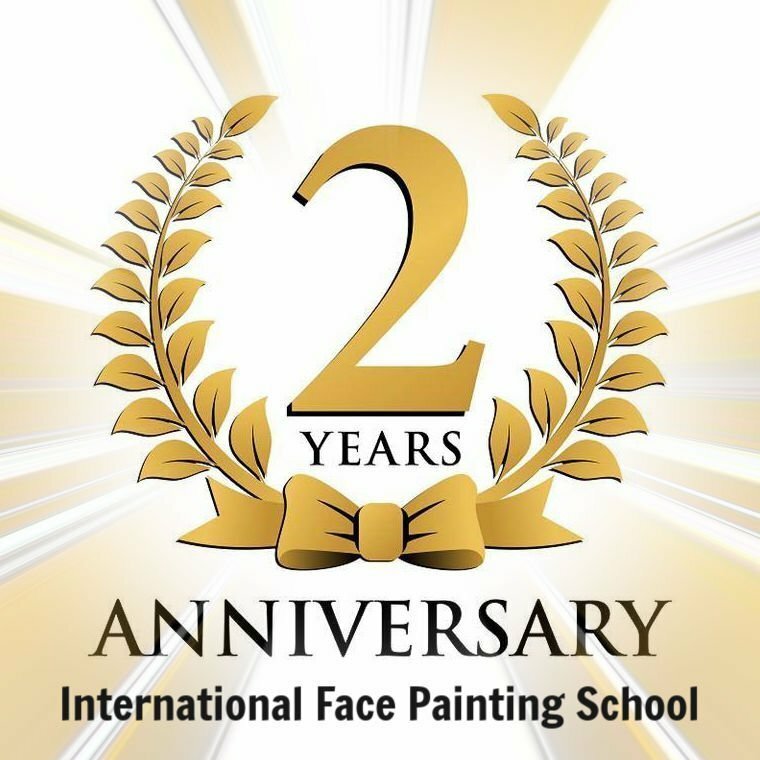 This gorgeous creation comes to us from Annabel Hoogeveen, who has recently graduated as an Honor student and is now preparing to become a certified International Face Painting School instructor. 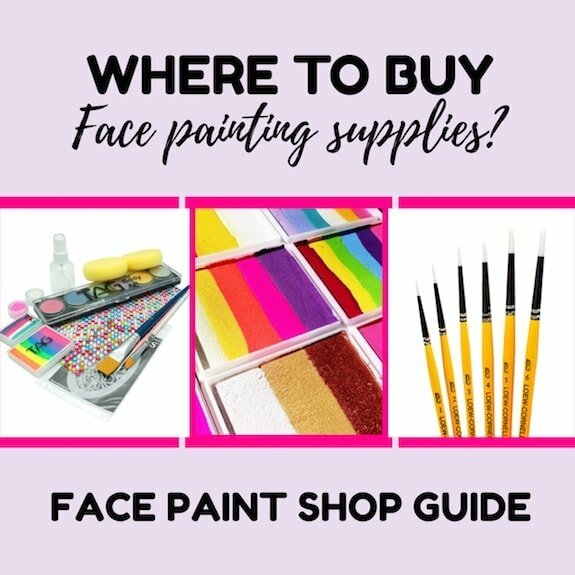 Don’t hesitate to check out our face painting for beginners step by step tutorial for even further helpful instruction! So, my first idea was to come up with a cat design that looked like an actual cat. 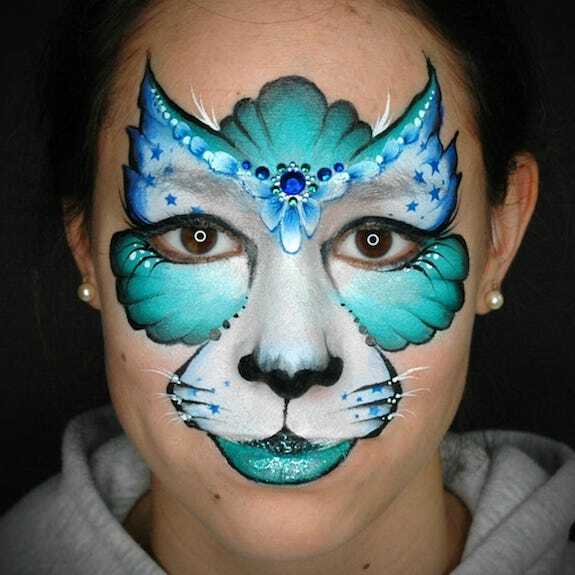 I started to sketch on my practice board, I looked at the features of a cat face and tried to incorporate them into a nice face painting design. The high forehead, the big cat ears and the small tight muzzle. But, I didn’t want it to be a realistic design. It had to be one that I could perform “on-the-job”. So I sketched and sketched and tried one on a real face. 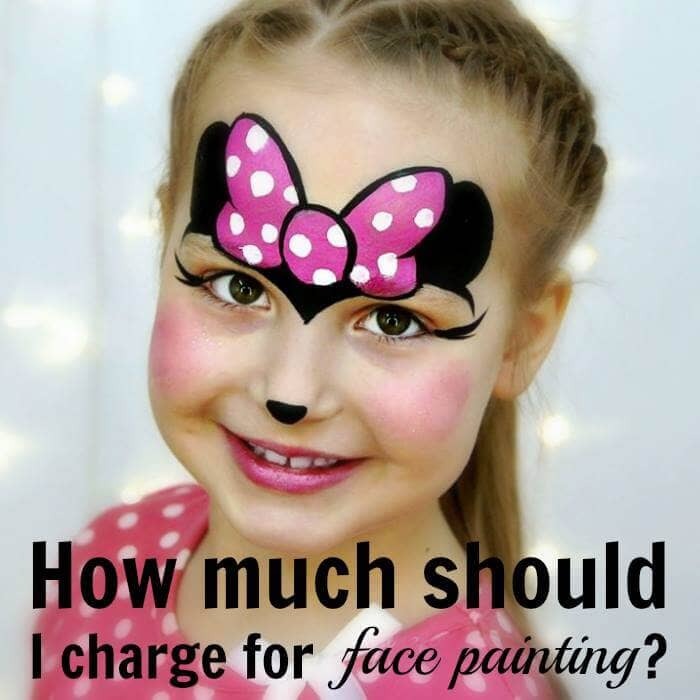 I knew that not everything that looks good on a sketch or practice board also looks good on the face. Some things I had drawn on the sketch were difficult to translate to the face. 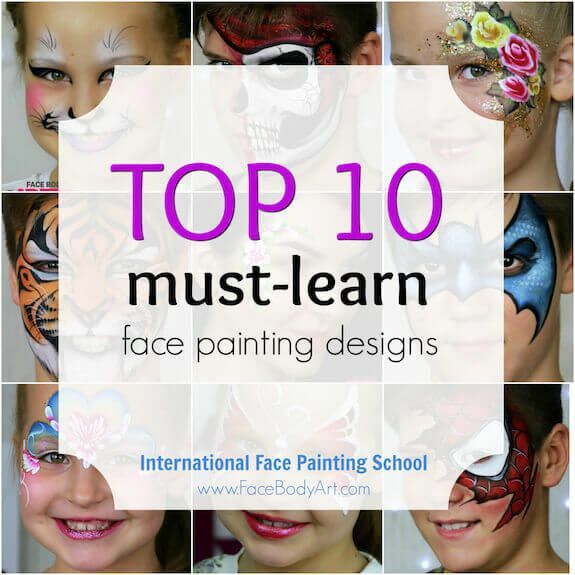 Tip: Want to learn under the thoughtful guidance of Annabel at the International Face Painting School?  Subscribe to our newsletter  and be the first one to know when she officially embarks her role as a School instructor! With a mix of metallic white and glycerin white, I sponged the basic shape of my kitty cat. I added some glycerin light blue to the ears, nose and muzzle and a metallic soft green on the outer sides of the cheeks and forehead. 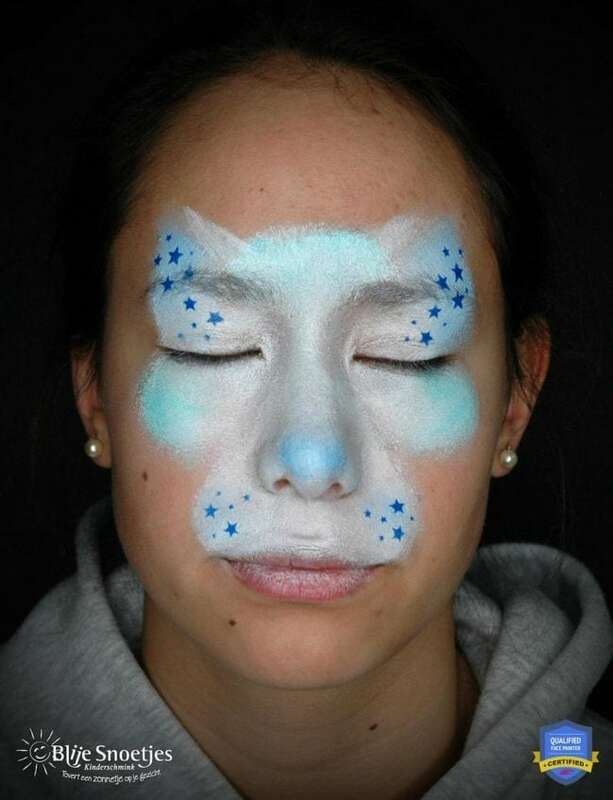 Next, I created some contrast with darker blue stars on the ears and muzzle using a BAM star cluster stencil. Tip: Be sure to check out our previous article “How to Choose the Best Sponge” to your sponge-work and stenciling looking clean and professional. After putting on the base, I outlined the ears with a blue and white split cake (any blue and white split cake will do) using a small angle brush (⅜ inch). I tried to pay attention to the shape of the strokes and the shape of the outline in total. It is more beautiful when the strokes are not all the same size and the outline is not simply straight. 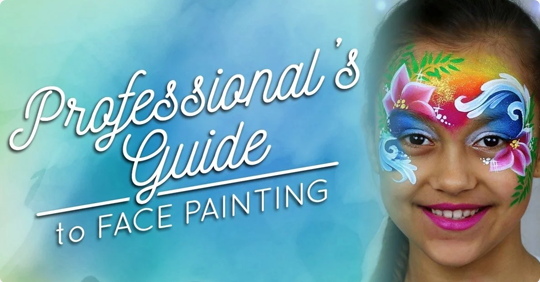 Using a 1-inch flat brush, I then outlined the forehead and cheeks with a beautiful green split cake combination from Silly Farm’s Arty Brush line, called “Aussie Mermaid”. Again, I watched the size of my strokes, trying to gradually diminish the size of the strokes from the center to the sides of the forehead and from the top of the cheeks to the nose on the cheek area. 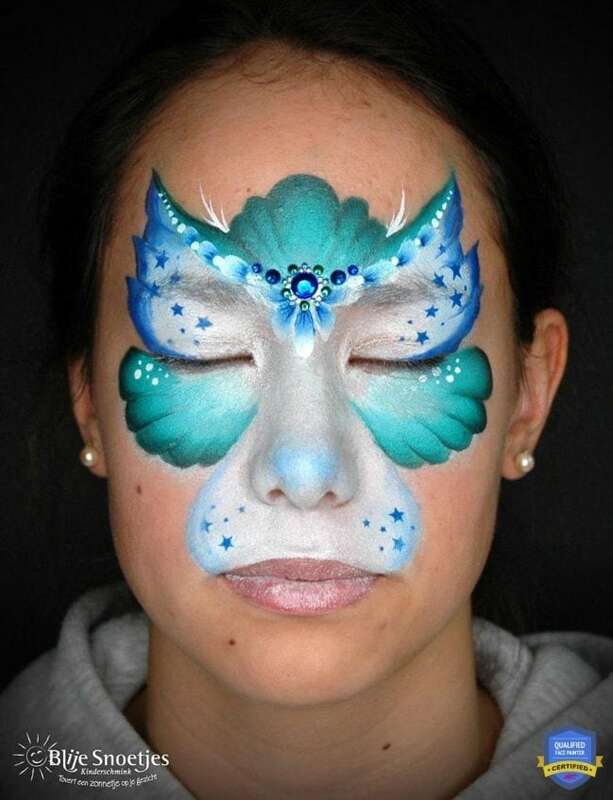 Symmetry is extremely important in these types of designs, our article “7 Steps for Symmetrical Face Painting Designs” will help you achieve a flawless result. 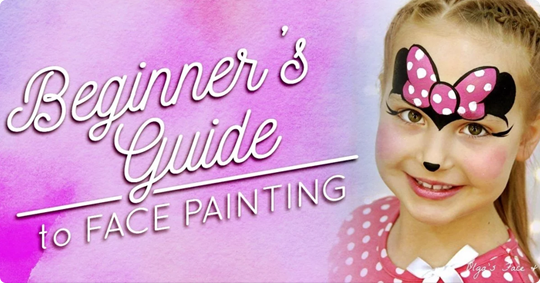 Now it is time to paint some double-dip flower petals on the forehead. With a very small brush, I accentuated the base of the petals with some darker blue stripes and added a gem cluster above the petals. After that, I added a cluster of white dots on the cheeks, a row of white dots next to the petals and a few white hairs between the “crown” and the ears. I painted the nose and muzzle area with black and softened the nose with a blending brush. 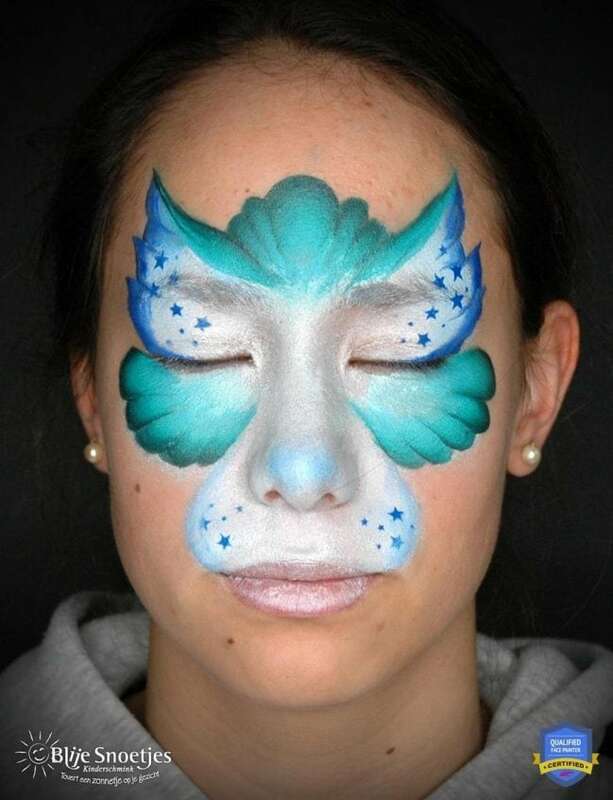 Next, I painted the lower lip with a metallic dark green (Superstar) and added light blue glitter (Paradise). To tie everything together I outlined the whole design in black, with a small round brush (no. 2). 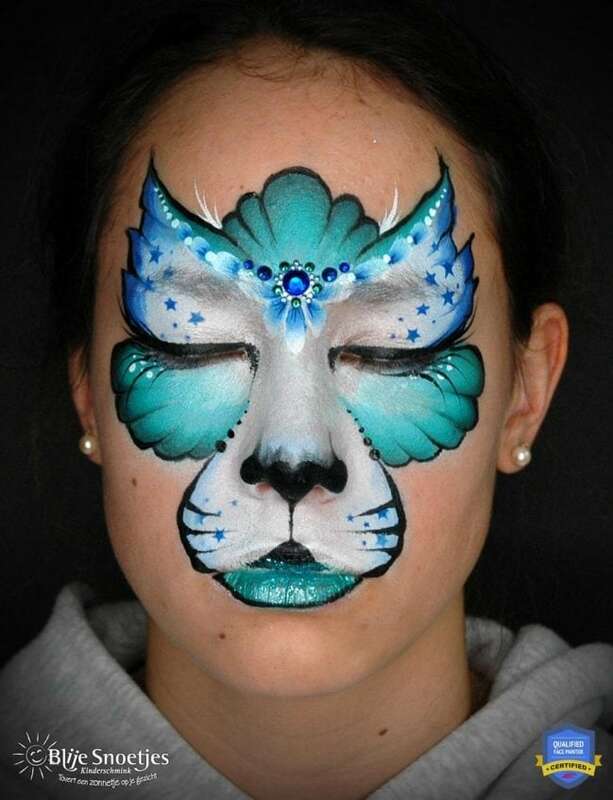 I gave my kitty cat a black eyeliner and girly eyelashes and added some dots between the cheeks and the muzzle. 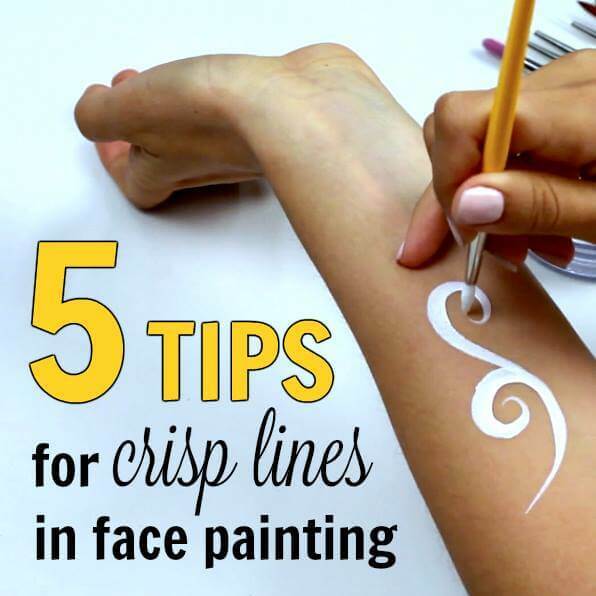 Tip: Check out our 5 Tips for Crisp Lines in Face Painting blog post and learn how to achieve stunning results with your linework. Because the white flower petals seemed to disappear in the white background I decided to outline them with a small brush and some blue to make them more visible. Finally, I added some small white whisker dots and some whiskers. 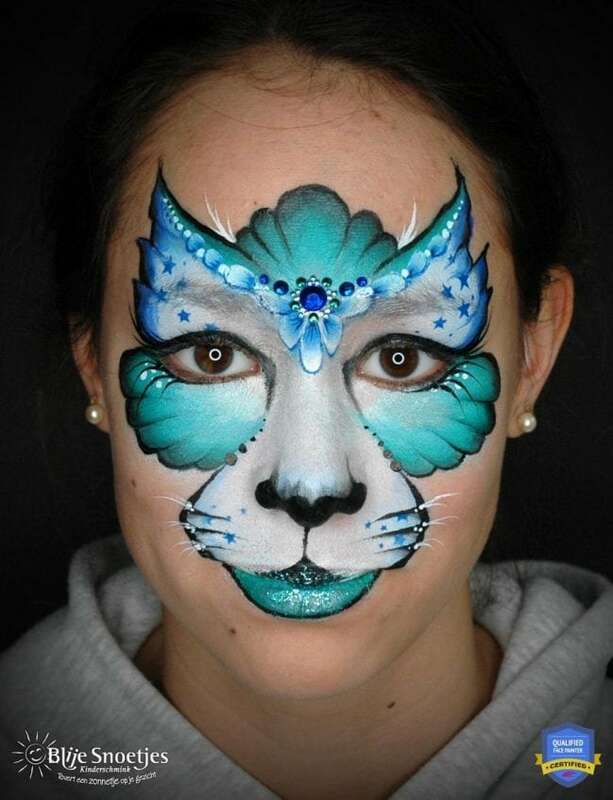 My girly kitty cat is finished! Tip: Connect with Annabel on social media so you too can be inspired by her work on Facebook, Instagram and her official website!